Half the fun of the Internet (capital ‘I’ please) is discovering new things, but it’s rare that you see something new that really changes your perception of things. 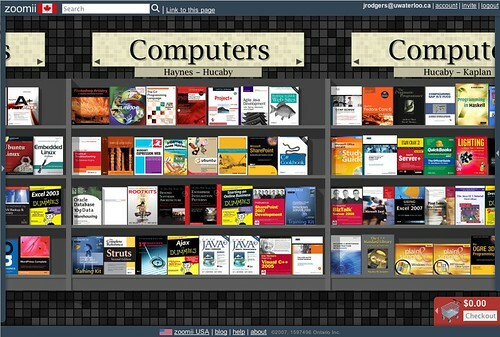 For me that happened when I came across the online bookstore Zoomii.com, which sells books via Amazon; think of it as a new front-end to the Amazon book site. You really have to try it out to understand it, but in a nutshell you navigate the ‘store’ via a huge overview of all the ‘books’ with an interface that feels quite a bit like Google maps since you can click and ‘drag’ the background. You can use your mousewheel to ‘zoom’ in on particular sections, all the way down to a particular book, which you can then click on to get all the info you normally get on a Amazon page. This is a cool UI, I’d like it if they released some source or a framework for this.